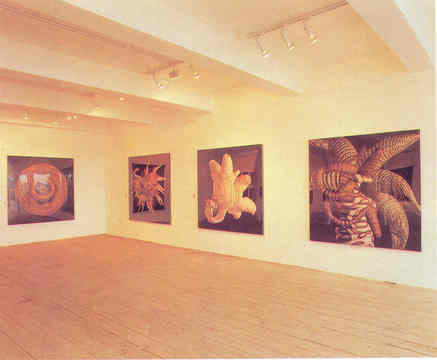 William Latham solo exhibition at the Arnolfini Gallery, Bristol, 3rd December 1988 – 15th January 1989. Curated by Stephen Snoddy and Barry Barker, sponsored by IBM. Tours the UK for the next 4 years to :- The Minories Gallery, Colchester. UK: The Milton Keynes Gallery. UK: Dean Clough Gallery, Halifax. UK: Cooper Art Gallery, Barnsley. UK: The Hatton Gallery, Newcastle-upon-Tyne. UK: The Harris Museum, Preston. UK: The Natural History Museum. London . UK: (1990) The City Art Gallery Dublin. Ireland: (1991) Karlsrue, Hanover, Germany: (1991) Deutches Museum Munich. Germany: (1991) Cultural History Museum. Magdeburg. Germany.